Do you know when to lie down? As I watched them at the Games, I thought of how their work was like a writer’s. Writers need speed when attempting a NaNoWriMo challenge or simply trying to make an editorial deadline. Swearing off the distractions of the internet and other social temptations is only possible by the sheer force of concentration. Without focus, novels ramble and become weighted down by too many characters and random actions. Finding Focus in Your Fiction by the Literary Corner Café discusses the pitfalls of unfocused writing. Patience, and a lot of it, is needed in the editing phase. Watch the Border Collies as they herd—they don’t run the entire time. Sometimes they seem to almost tiptoe around the mob. Other times they simply lie down and strong eye the stock. Of all these virtues, for me patience is the most difficult one. I want to chase those sheep until they’re rounded up and through the gate but that’s not how life works. 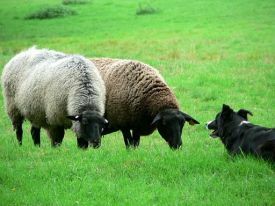 Watch this champion dog Nell as she lies down and nudges the sheep to her will. Sometimes I need to just back off and strong eye my manuscript. Look for the stray story lines and extraneous characters that are cluttering up the scenes. What is the hardest part of the writing discipline for you? Are you impatient? Do you focus on word count while giving character and plot development less time than they deserve? Do you need to get in front of your work, lie down, and give it the strong eye?